Continuing with yesterday's incense theme, today I'm wearing Incense extrême, the latest from indie niche line Tauer Perfumes. According to perfumer Andy Tauer, the ladies over at Perfume Posse wrote to him because they were curious what an incense fragrance from Tauer Perfumes would be like. Et voilà, here we have Incense extrême, and Incense rosé is expected to launch in March. What could be nicer than that? When I first heard the name Incense extrême, I pictured a big-dark-gothic "whack you over the head" kind of incense fragrance, and while I'd have no complaints over such a thing, Tauer's Incense extrême is something quite different. The "extreme" part comes from a 25% concentration of Boswellia serrata (aka Indian frankincense), but the fragrance aims to play up the fresh and crisp aspects of incense, and to capture "the roughness of the climate of the semi desert where Boswellia trees thrive". The opening is bright and crisp, as advertised, with a touch of sharp citrus and a goodly dose of spice (the notes: coriander, petitgrain, iris, incense, cedarwood and ambergris). Lest you weren't sure just how heavy a 25% concentration of incense would be, let me assure you that it is LOTS of incense. It does very nearly knock you upside the head, just not in the way I imagined. And while it's appropriately rugged (it really does call up the untamed desert*), it also retains a feeling of weightlessness — it is neither dark nor churchy, and does not feel overwhelming on the skin. Assuming, that is, that you really love the smell of incense. If you don't really love the smell of incense, I can imagine that you might find it rough going. As it dries down, it gets smokier and woodier, but the iris smoothes and softens some of the rough edges. The closest comparison I can think of would be to Comme des Garçons Ouarzazate, but Ouarzazate is a quieter, smoother, tamer scent. Incense extrême is not going for polish and refinement; it is, like Tauer's Lonestar Memories, a fragrance about the outdoors. I suppose it is perhaps on the masculine side, but it isn't swaggeringly so, like Olivier Durbano Black Tourmaline, and I find it very easy to wear. I'm also thinking its minimalist character might make it a perfect layering agent. Nice. 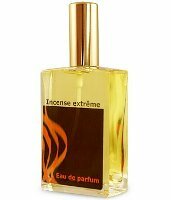 Tauer Perfumes Incense extrême is available in 50 ml Eau de Parfum. For buying information, see the listing for Tauer Perfumes under Perfume Houses. * See this picture of Frankincense trees (Boswellia sacra) growing in Oman. The areas of India where Boswellia serrata grow look quite different, but the Omani desert shown here is to my mind a perfect visual match with the smell. I expected “a big-dark-gothic “whack you over the head”” too This was surprising. You are right, 2008 is shaping up to be The Year of Incense. And I might eventually get tired of it, as I got tired of iris. Girlz, the year has just begun ! Heh, I'm not one for incense perfume, the medium is wrong for me I think. When I think of incense, the visual (if perfume can have a visual) is strong and enveloping in a WIDE space. The concentration that is present in one dab or spritz to deliver the incense experience is way too strong. I love incense stick, but my fav, aloeswood, is not in the typical incense profile. East coast perfumistas, have you been outside today?? It's gorgeous! I love incense, and I'm looking forward to trying this. I like rose, too, esp. when it's dark, so the Incense Rose might be even better. The Year of Incense sounds great to me! Iris is a note that I wasn't at all sure of, but I ended up enjoying both Silver Factory & the Prada iris one from 2007. Very much agree on the pink pepper & lychee! Now I'm getting a bit tired of that ubiquitous clean patchouli base note. That pic is worth a thousand sniffs, Robin. Thanks for that — and also the suggestion to Google “Gathering Frankincense”. I'm so much more knowledgable than even 12 hours ago!! Ah, glad you had fun exploring! Chicken stuffing! I don't know. There is something *thick* about lots of incense, but wouldn't have thought chicken stuffing — hope someone else will chime in on this, I've no idea what that is. Fine by me if jasmine comes back in any form! I love jasmine. Incense extreme would actually be gorgeous layered with a dry green jasmine. Maybe Sage, that wouldn't be out of the way with incense? Sage always smells like stovetop to me! VanillaGirl, I think you're on to something. I'm imagining chicken stuffed with pecans, dried red fruits and tarragon a la Chypre Rouge!!!! And, you know, in real life, a roast chicken is utterly delish done Provencal-style, stuffed with fresh lavender leaves, deglazed with vermouth, and finished with a splash of heavy cream. Mmmm. . ..
is it just me or did this remind anyone else of Comme des Garcons Red: Sequoia. havent tried them side by side yet, but from smelling them together my memory of sequoia seems like it might be correct. When an incense fragrance is churchy, then is it not for me but otherwise I will be happy to try it! jpaller, It didn't remind me of Sequoia, but maybe I need to try them together! I like lavender in tea & chocolate — haven't tried it in cheese yet. I also found the IE not-so-extreme – the name's slightly confusing. I love the way it amps up the orris note (that Andy is known for, in his Orris [discontinued] scent) while still remaning incense prominent. For lovers of Orris that have been missing that particular note – get IE, it's there! I'm also gonna wait for the Incense Rose – before I buy the IE. Anyway, also looking forward to Incense Rose, although I think that one will be more of an oriental, and so I'll probably like this one better. This definitely sounds worth sampling from your wonderful review. I've become a minor incense fiend lately and I see my enjoyment of it continuing through the cooler months. I'm addicted to Timbuktu, and recently sampled all the Comme de Garcons Incense series (I know, behind the curve) — I'd buy every one in the series immediately if I could, but settled on starting with Zagorsk. Ouarzazate is wonderful too, but very tame, so if Tauer IE is an amped-up version of that, it will be great. Bit pricey compared to the CdG, alas. I have to put in a plug for Ouarzazate, though — it *is* tame, I can't argue, but gosh I love it. It is actually the only full bottle I own from the incense series (although Avignon & Kyoto are on my list) and it is soooo soothing and bright. It is my “go to” scent when I need calming. CdG seems to be in the process of raising their prices — like everyone else. The dollar simply *must* recover!!! Anyway, they may end up pretty darned close in price. Almost a year since the review – typical for me! My Mom is an artist and mixes a lot of her own pigments with all kinds of dark alchemical secret magic – this smells EXACTLY like something in her studio – resinous and turpentine-ish. I'm going to have to let her sniff this – I think she'll know exactly what I mean. I like this, but I am already toeing the line of smelling like my Mom with various vetivers. How interesting! Do come back & tell us what it is after you figure it out! I am fast becoming an Andy Tauer fan. You’re totally right – this would make a great layerer! It doesn’t evolve too much on my skin after the inital burst. But after a while, it settles into a gorgeous resinous glow that I adore. The Incense Rose has more complexity and is more transformative. But, i am now leaning towards this actually. It possesses something minimalist and raw that I find so appealing. Out of interest – what kind of frags does incense layer well with? Anything woodsy and vetivery i guess?!?! Would it add a bit of grit to lighter florals?! I’ve not ventured much into layering yet, so have no idea what I’m doing! I really like incense with light florals, personally. You have to work on finding the right mix so the floral isn’t overwhelmed though. And — I don’t mess around with layering as much as I should!